Former finance minister Ignatius Chombo, and Messrs Kudzai Chipanga, Innocent Hamandishe (file photo). Former Finance Minister Ignatius Chombo has been issued with a warrant of arrest after he failed to turn up for trial Wednesday with claims he was ill and bedridden. Chombo was supposed to appear before Harare Regional magistrate Hosea Mujaya to answer to charges relating to alleged "criminal nuisance". He is jointly charged with former Zanu PF youth leaders, Munyaradzi Hamandishe, Kudzanai Chipanga and former MP Mathew Muleya. Trial failed to commence amid claims that the former Zanu PF secretary for administration was ill. His accomplices were remanded to a later date for trial. It was reported that Chombo is bedridden and unable to appear in court. Professor Lovemore Madhuku is representing Chombo and Chipanga. Hamandishe is being represented by Emmanuel Samundombe. At the time Chombo was being issued with a warrant of arrest, his lawyer was at the High Court to file an application challenging his prosecution. Chombo was also absent at the High Court. 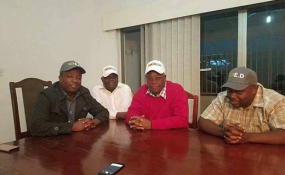 According to the state, sometime between December 8 and 13, 2017, the trio "connived" to pose in Zanu PF regalia. It is alleged that they took photographs of themselves wearing headgear (caps) inscribed E.D (Emmerson Dambudzo) and Kutonga Kwaro with an embroidered Zanu PF flag. They posted the pictures on social media, an act perceived by members of the Zanu PF hierarchy as "criminal nuisance". It is alleged that the three had no right to act in the manner they did. Chombo and his Zanu PF colleagues are among some party bigwigs who fell by the wayside 2017 when the military staged a coup against then President Robert Mugabe and installed in his place, Emmerson Mnangagwa, then leader of a rival party faction.